A Royal Shakespeare Company production and world premiere of a play by Pam Gems, performed at The Other Place, Stratford-upon-Avon (opened 11 October 1978). 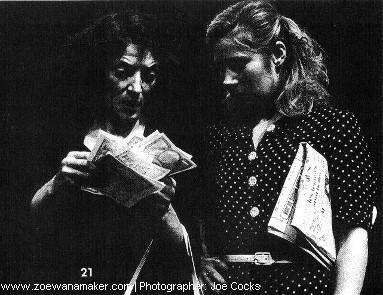 Both photos show Piaf (played by Jane Lapotaire) and Toine (Zoë Wanamaker). This was the premiere production of Piaf, which examines the life of legendary French singer Edith Piaf, from the late 1920s until 1963 (the year in which the singer died). Far from being a glamorous potrait of the star, the biodrama offers an unflinching exploration of the tension between Piaf's private and public life, particularly in the light of the singer's working-class roots. To underscore Piaf's humble origins for English-speaking audiences, the singer and her friends spoke with Cockney accents; songs were delivered in a mixture of English and French. The staging was suitably spartan, with little more than a couple of chairs. Among the songs performed during the play: 'O Sole Mio', 'La Belle Histoire d'Amour', 'La Ville Inconnue', 'L'Accordeonist', 'Deep in the Heart of Texas', 'Les Trois Cloches', 'Les Momes de la Cloche', 'A Quoi Ca Sert l'Amour', 'Le Droit d'Aimer', and 'C'est Hambourg'. Some cast changes were made when Piaf moved between theatres. Piaf is one of the many productions in which Zoë performed with the prestigious Royal Shakespeare Company. She joined the RSC at a very interesting stage in its development, sensing an exciting new dynamic among the actors. 'Some of us now at the RSC have a different sort of energy that has not been smoothed, shined or made acceptable. I like that', she commented at the time (see 'I Yearn To Be So Free and Comfortable on That Stage' interview). For Zoë, this production marks a turning point in her career: 'I was doing Piaf with Jane Lapotaire, and I never knew what to do with my hands. Suddenly I realised I wasn't thinking about my hands. I was thinking about who the person was, and that for me was a great feeling of achievement - something as stupid and as simple as that' (see 'So Many Different Characters' interview). 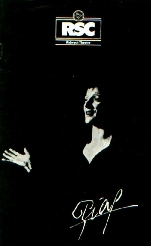 As Jane Lapotaire (who played Piaf) has remarked in an interview for Whatsonstage.com, a very positive mood pervaded among Piaf's cast and crew, no doubt bolstered by the production's considerable success. She and Zoe subsequently appeared in the similarly successful American production of Piaf. In addition to Piaf, Zoë's RSC productions during the 1970s include The Devil's Disciple (1976), Ivanov (1976), Wild Oats (1976), The Taming of the Shrew (1978), Captain Swing (1978), and Once in a Lifetime (1979). 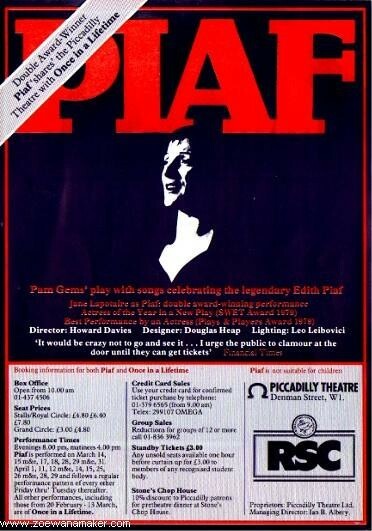 The latter was performed alongside Piaf at the Piccadilly, as mentioned on the theatre's flyer. During the 1980s, she returned to the company for Twelfth Night (1983), The Comedy of Errors (1983), Mother Courage and Her Children (1984), and Othello (1989). Zoe and Jane Lapotaire made 'a splendidly pugnacious double act' in Piaf, remarked Irving Wardle in The Times.